Funkmaster V's Uptown Cabs of Renown: Uptown Cabs is One Year Old!!! Uptown Cabs is One Year Old!!! 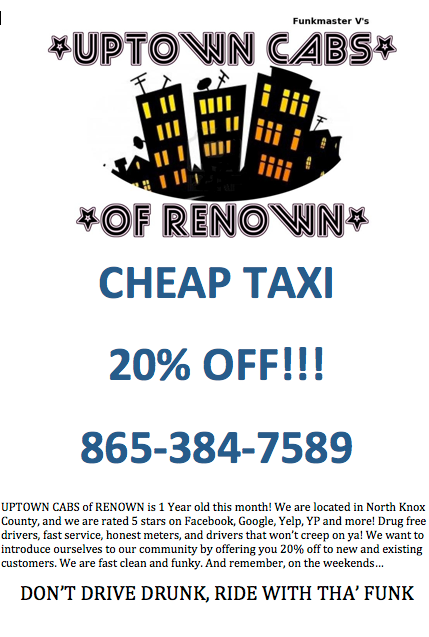 Funkmaster V's Uptown Cabs of Renown is one year old this month! MY MY MY how the time has flown. Here's a month long special. If you receive this in your mailbox or print it off of your computer, you can use this coupon for 20% off of your fare~~~ ANYWHERE (Excluding Mars). Help up celebrate our birthday the right way!!! !